We’ve made a mini time machine for you that allows you look at your rankings from way back when. Al the information from your ranking details from 1 week ago up to a whole year are available, provided that your campaign was running at that time. There a a number of scenario’s where this can be a handy tool. For example, when you changed a number of pages in your site and you want to look a couple of weeks back to see if the highest ranking URL had changed for some keywords. Or if you see a sudden jump or fall in your in your site’s visibility index, but you are a couple of weeks late before you noticed and you want to check out what the most import keywords were. In these situations it is now a lot easier to track the changes. 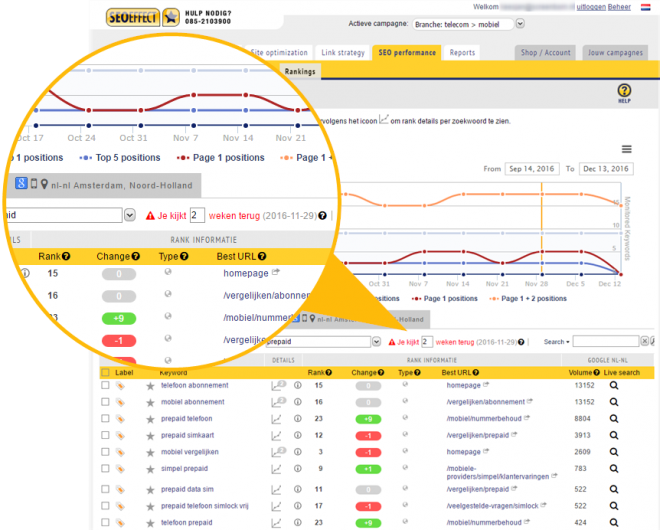 No longer opening the individual graphs of all your individual keywords. Just looking at the changes in the week just after the fact will tell you what is what. Fill in the number of weeks you want to look back and hit enter or click outside the text box. (To return to the present: fill in a 0 or blank an hit enter). In orange a line is added to the graph to indicate the week that is shown. 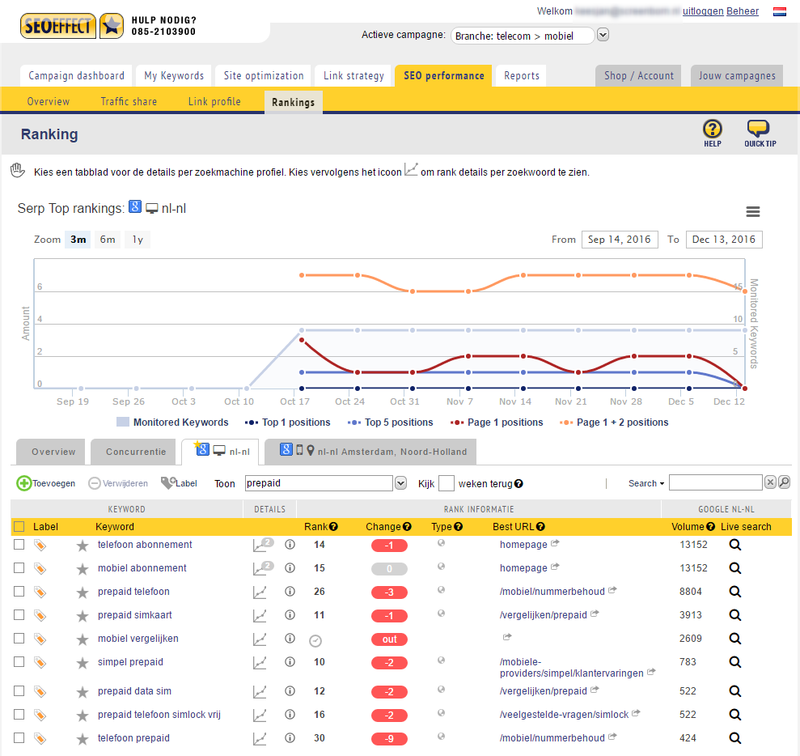 In this example you kan see that the keyword ‘Mobiel vergelijken’ which is ‘out’ for the current week, was ranking 3rd with the homepage. In this case a measuring hiccup (notice the clock) for a measurement that is still due. So nothing to really worry about for this website! 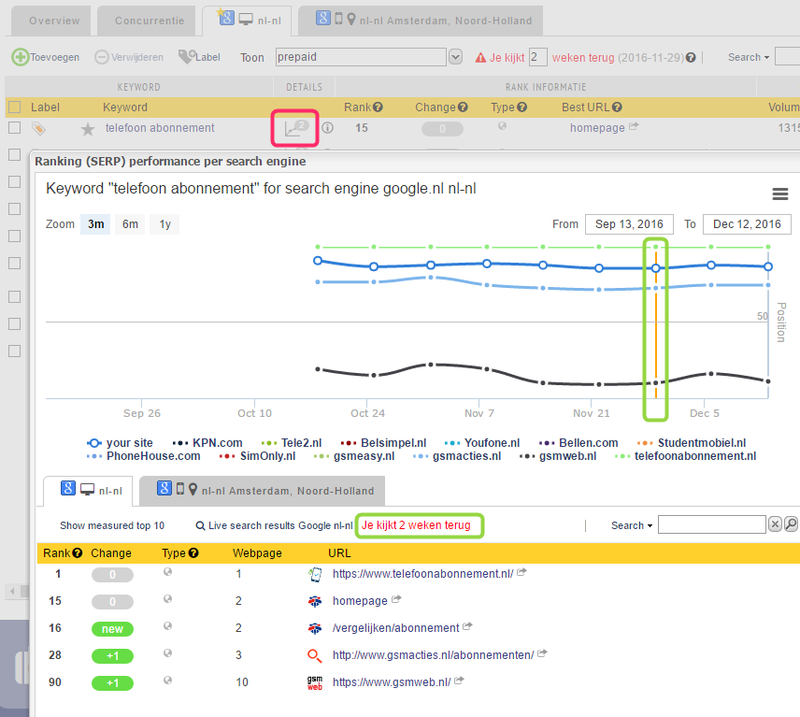 The number of weeks is also shown in other search engine profiles ans also in the details per keyword as shown below. Don’t forget: This only works if your campagne was active at the time. The table will show the data from the chosen week, the chart on top of the page wil show all datapoints from last year and a marker on the selected week.